Background While laboratory data suggest that antidepressants may promote mammary tumor growth, there has been little research investigating whether antidepressant use after breast cancer diagnosis is associated with the risk of breast cancer recurrence. Methods We conducted a retrospective cohort study within Group Health, an integrated healthcare delivery system in Washington state. 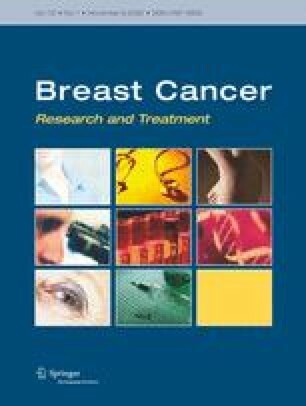 Women diagnosed with a first primary invasive, stage I, IIA, or IIB, unilateral breast carcinoma between 1990–1994 (aged ≥65 years) and 1996–1999 (aged ≥18 years) were eligible for the study (N = 1306). Recurrence within 5-year of diagnosis was ascertained by medical chart review. We used the pharmacy database to identify antidepressant dispensings from Group Health pharmacies. We used multiple Cox regression to estimate the hazard ratio for recurrence and breast cancer mortality, comparing users and non-users of antidepressant medications. Results for recurrence were examined separately in users and non-users of tamoxifen. Results We did not observe an association between antidepressant use after breast cancer diagnosis and the risk of recurrence either in general (hazard ratio for any antidepressant use: 0.8; 95% confidence interval: 0.5–1.4) or for specific types of antidepressant medication. Risk of death from breast cancer did not differ between non-users and users of antidepressants. Conclusions The results of this study suggest that women who use antidepressants after breast cancer diagnosis do not have an increased risk of recurrence or mortality. We would like to thank Rebecca Silliman, MD, PhD for developing the data abstraction instrument, leading the BOW study, helping to secure funding and providing guidance throughout the project; and Soe Soe Thwin, PhD for developing the data abstraction instrument and sharing common programs from BOW. We would also like to thank project manager Linda Shultz, MPH and our colleagues who collected data for this study: Kristin Delaney, MPH; Margaret Farrell-Ross, MPH; Mary Sunderland; Millie Magner; Beth Kirlin, Srabani Dutta, Chester Pabiniak, and Julia Hecht, PhD. This research was supported by: National Cancer Institute (R01 CA09377, T32 CA09168 to JC); American Cancer Society (CRTG-03–024-01-CCE). The contents of this publication are soley the responsibility of the authors and do not necessarily represent the official views of the NCI, NIH.